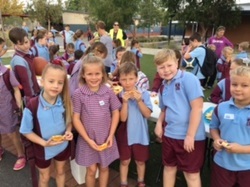 Wodonga Primary prides itself on providing unisex uniform options which are easily affordable to ensure families can all meet the expectations of clothing students in full school uniform every day. Every student is expected to wear school uniform every day. The school office stocks new WPS branded school bags, hats, satchels, socks and scarves. All clothing is available from the uniform shops located within the Wodonga CBD. We also stock a small supply of good quality second-hand clothing, please ask at the office. Items start at $5. A school branded broad-brimmed hat is essential in Terms 1 & 4, and is recommended at all other times especially when attending sporting events. Hats are just $10 and can be bought at the school office. 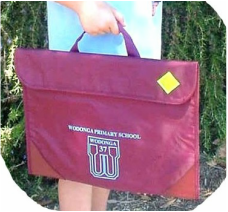 A WPS reading satchel ensures books and readers arrive home safely, especially for students in Years F-2. It is fully waterproof and is just $10 from the office.. The school office stocks WPS school bags in two sizes, socks and scarves. All these accessories are optional. 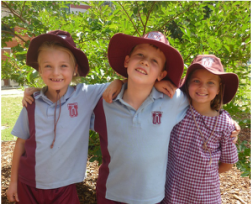 ﻿New uniforms can be purchased from any of three Uniform stores in Wodonga. .
​The school stocks some secondhand uniforms - supplies are dependent on availability / donations.